nameSherry: PEE MAK comedy and horror movie! Funny til the end! PEE MAK comedy and horror movie! Funny til the end! Have anyone watched Pee Mak movie? I am happy to say I watched it with my dear and we enjoy the movie from start til the end. Yes it is comedy and horror, yeah we saw parents with baby stroller in the theatre too! No kidding, we spotted two strollers inside, I don't know how children that young can watched the movie. Say the children is under 2 year old or 3 year old?! Pee Mak came back his hometown to find his wife and newborn baby. Pee Mak brings along four of his friends who gone for war with him. He almost died in the war but he didn't, he wants to live on to see his wife and baby. Sad to say that his wife and baby died. He didn't know his wife is dead. Funny to say how's the movie is about whose the ghost in the movie?! Pee Mak's friends thought he was the ghost, then their friends' Aey because he has the ring of a dead person! One of them kicked Aey off the boat. It's funny to see the boys eating dried leaves in the movie, yeah one of the bowls contained of worms with leaves. How can a ghost live with a human?! Well in this movie, anything is possible. Don't worry if you don't understand language of the movie because there have subtitles of English, Malay and Chinese language. 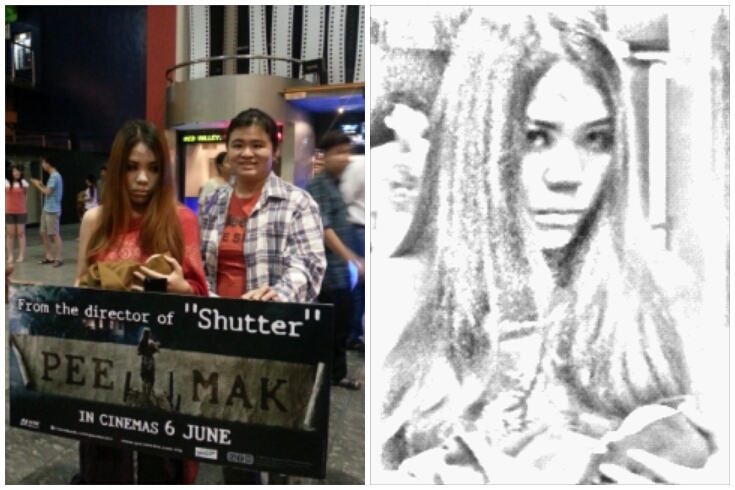 One gal dressed up just like Pee Mak's wife after movie walking in GSC Midvalley. No kidding she's holding a baby too. Don't worry the baby is fake! This movie is rated PG13, yeah parents can bring children to watch if they like. However I am not sure if the children like the sound of the movie. And wow that girl looks really creepy :O Is there a costume contest going on there? ?